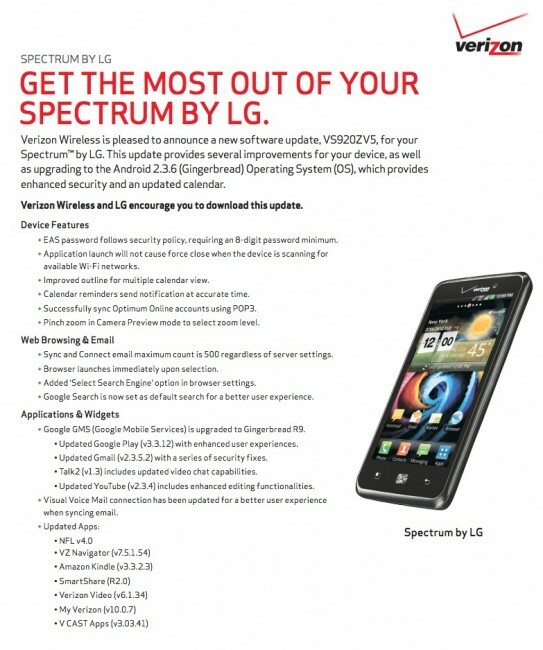 The LG Spectrum will receive a substantial update in the coming weeks as build VS920ZV5. After updating, the phone will run Android 2.3.6, have Google Search set to default for “a better user experience,” freshly polished bloatware (VZ Nav, NFL Mobile, VCAST Apps, etc. ), and a whole bunch of other enhancements which you can read about in the image above. The Spectrum seems to have been forgotten about for the most part, but if you are in need of a smartphone with a beautiful screen, decent camera, and 4G LTE for a reasonable price, it’s worth a look. You can read our full review of the Spectrum here. The update is 127 MB in size. More info.